Hereby I present you my Top 40 F&B of 2010, some of them might dated from 2010 but hell, they’re just too good to be forgotten. I didn’t include the price since some of them might already updated without notifying me (what the..). Also some of them might be too common as well, but people seek common things right? If it’s too exotic, they might not like it as much as I do. However, it’s a mix-it-all-up list that balances everything. Feel free to come around to these joints and try ’em up. Disagreement is much respected but if you’re out of line, then you might as well get out from here. Anyway, cheers! Oh ya, the list here is in random order by the way. 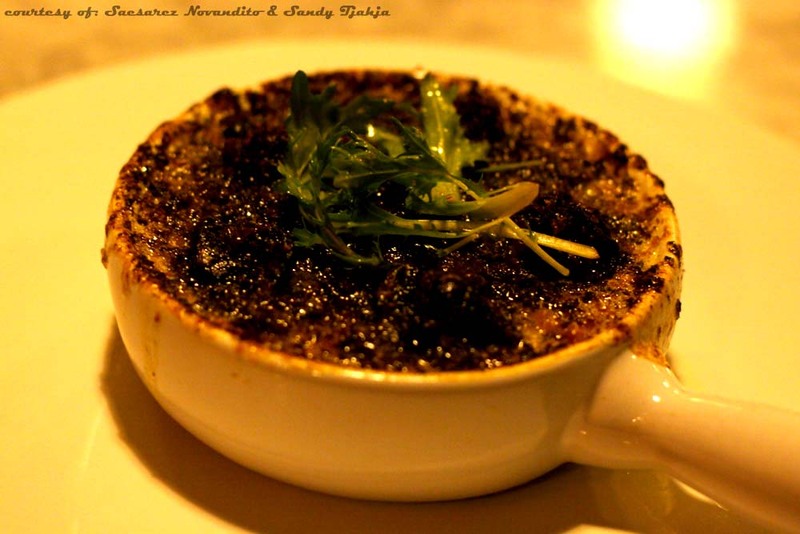 What’s better for an appetizer than a plat de escargot full of fresh snails covered with thick butter and herbs? The only one that can serve it decently and furiously appetizing is only Chef Antoine Audran from Java Bleu. He knows his way around Indonesia and with his rustic style and hearty dishes, he serves what’s best from French cuisine. Don’t stop at the appetizer, ravage the rest and you’ll know what I mean. 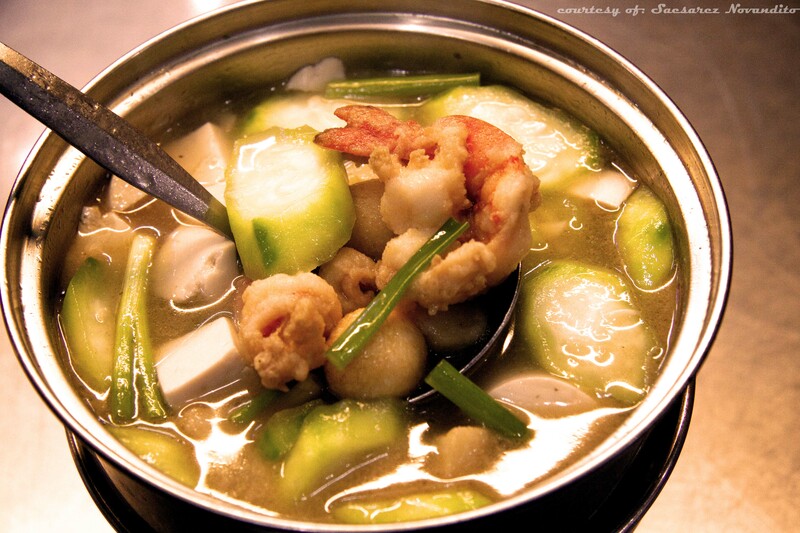 For many decades the tofu soup from Mandala has ruled over many generations of Jakartans. It may sound simple but once you feel the delicious broth combined with many nutritional elements inside such as the tofu itself, silk gourds, and seafood or chicken, you’ll be instantly zapped to heaven. The broth itself is the essence of the dish, it’s the soul of the all the goodness you’ll feel. Gandy may be old and dates back to the memory of my father where he remembers that Gandy serve decent steaks. 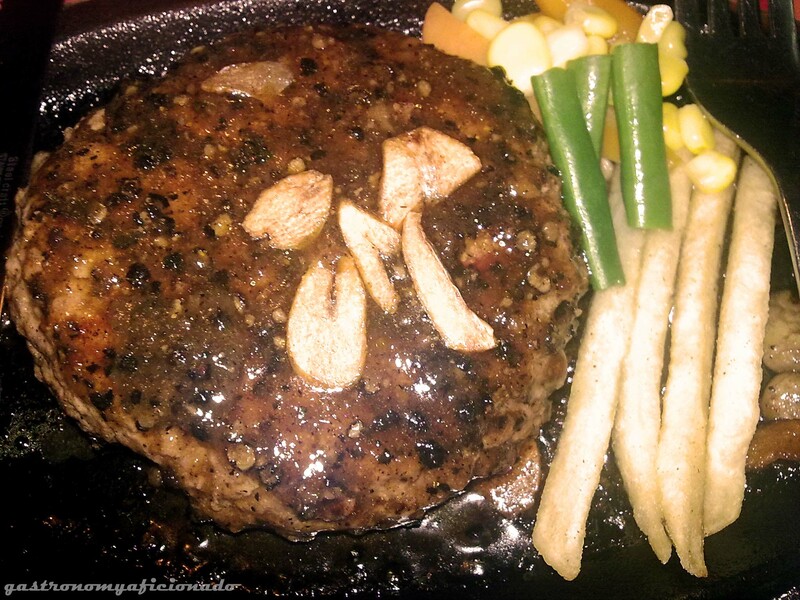 Being curious, I found out at last that they do serve good old juicy beef steak with opulent black pepper sauce. Served wholeheartedly on a hotplate, the 250 grams of Tenderloin was a sight to see and a pleasure to be harnessed. Make sure you ask for more black pepper sauce because it won’t last long before you can even finish the good meat. It’s all-in-one test for Chef Christer Foldnes from Norway, a specialist of seafood and I was dumbstruck by his might and magic with this wonderful dish. Consisting of grilled fresh lobster, salmon, prawns, sausage, lamb chop, and steak, this dish can be the benchmark of every dishes C’s has to offer. The lobster was sweet, the prawns were perfect, the salmon was very fresh and impeccable, yet both the beef and lamb were tender and juicy. All grilled to perfection! Thai food is not always about tom yam though we must admit that it’s usually related with sour and spicy theme. Aro Aroy comes gracefully to teach us how to enjoy sautéed seafood washed with thick curry and eggs. 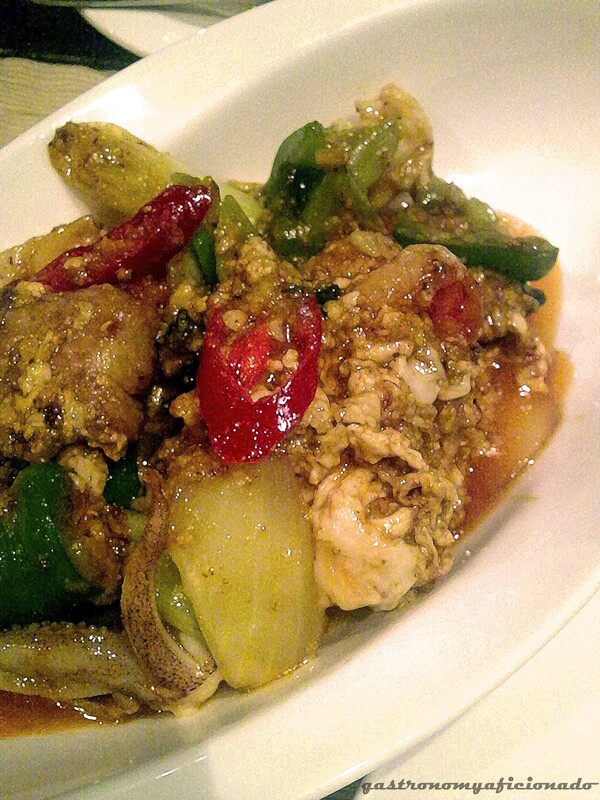 It’s a harmonious blend of savory seafood and the spiciness of the curry added with the capsicum and chili. Top it on a plate of warm, fluffy rice and you’ll feel the taste of Asia there. 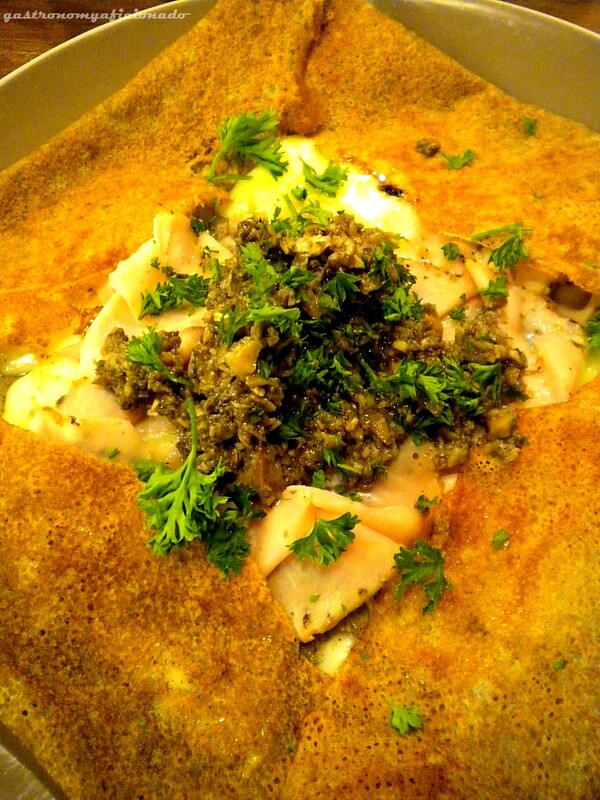 For those who got tired of sweet crepes, why not try on this delicious French galette? It was a savory dish many options for the fillings. The name of the dishes funnily derived from French male names such as Antoine or Arnaud. The one I had was a good composition of galette filled with turkey hams, mozzarella cheese, and mushroom caviar with truffle oil. It’s a well balanced dish, fulfilling, and tasty. Snow Monster is the new froyo fever. 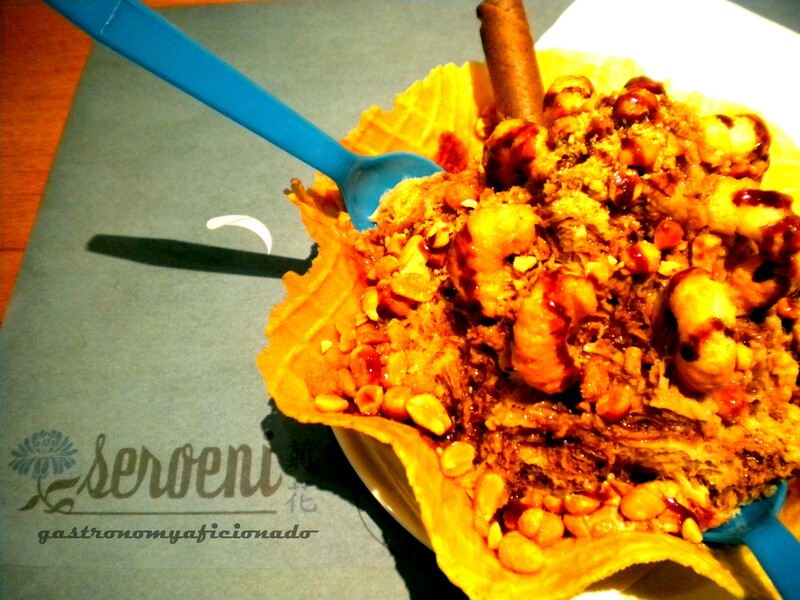 It’s not a yogurt at all but it’s a shaved ice fare, customized, and served on a crispy waffle with many kinds of variations. The one I had was this chocolatey, milky, and indulging shaved ice. It’s cheap and you can share your dessert with somebody else! Bring your family for a good Peranakan food here and close it with a fine shaved ice desserts to make it even a happier day for everybody. At first we thought that this place boasts only its pizza and beer but try instead the astonishing chili con carne for the appetizer first. 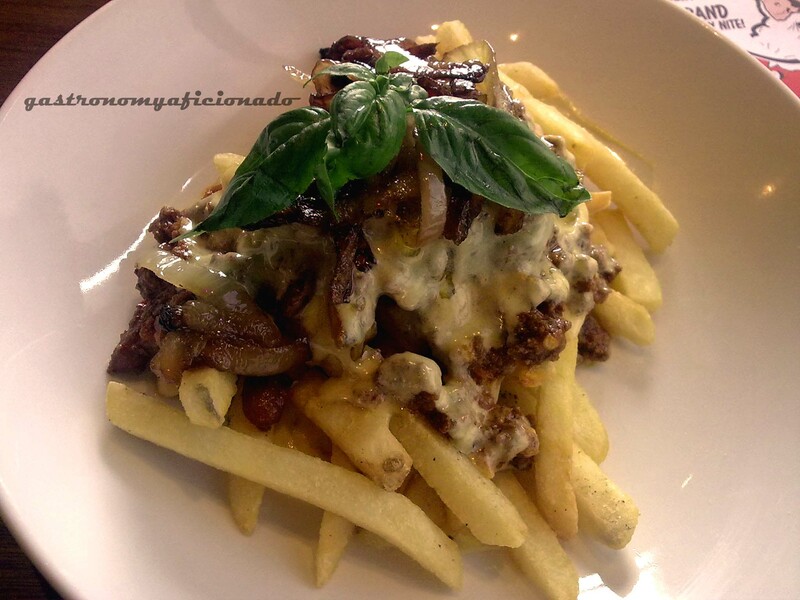 It may be only French fries poured by the traditional chili, meat, and bean a la Mexicano but they magnify the scrumptious dish with blue cheese sauce as well and outranked even the pizza itself! Have a try! Dreaming of the stupendous richness and sweetness of Turkish baklava in Indonesia is now only a few minutes from reality. 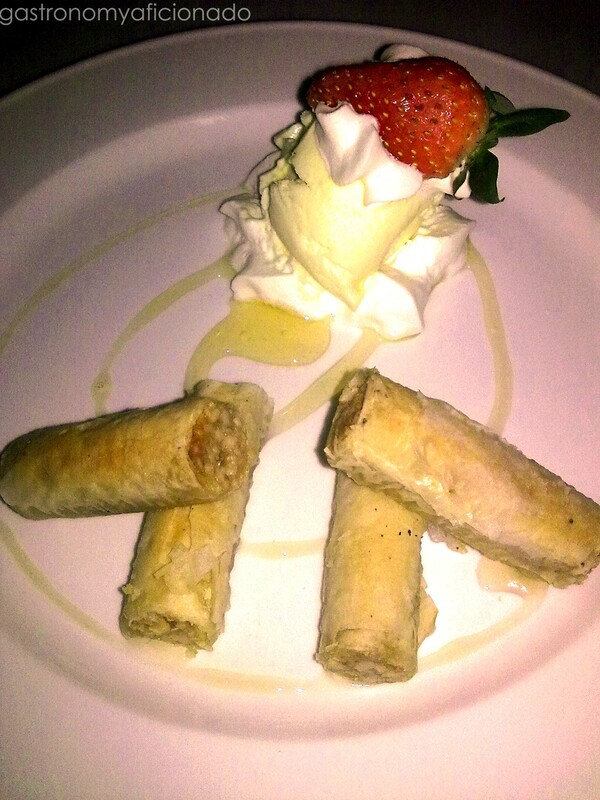 Bibliotheque serves homemade baklava combined with only vanilla ice cream, whipped cream, and fresh strawberries. Appears in simplicity but it does worth more than a usual cake for a dessert. The Turkish likes it sweet and we all do! 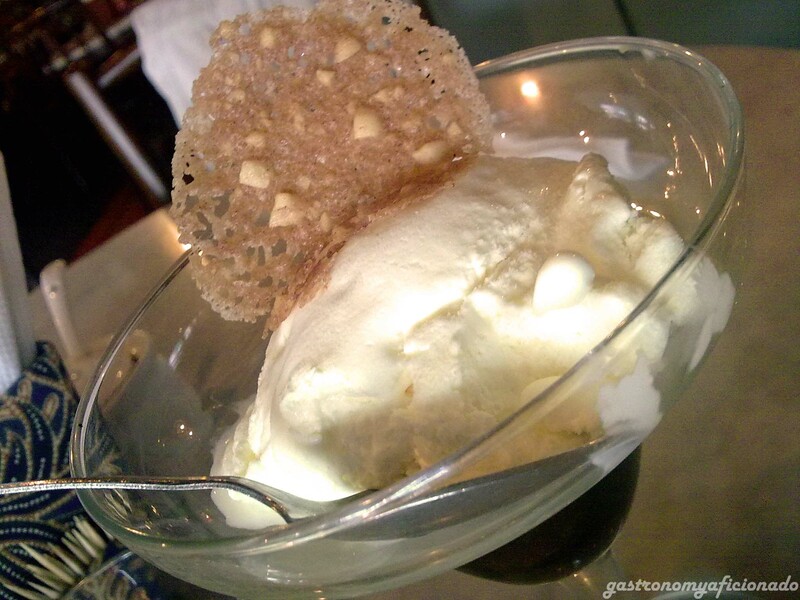 The classic Austrian dessert now proudly introduced by Bondan Winarno, the Indonesian culinary prodigy, at his café. A scoop of the good old vanilla ice cream dipped on a couple of shots of espresso. Feel the refreshing, sweet sensation that blends in with the bitterness of the coffee on a hot summer day. Tan Goei was the original name of this proud, old establishment. 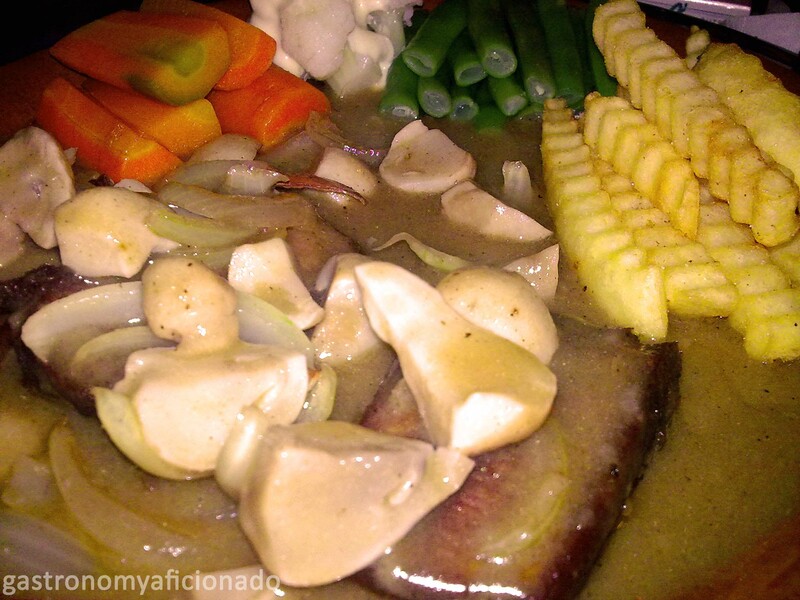 For many decades they’re successfully heralding the colonial dishes with the homemade classic gravy sauce undisputed for its authenticity and deliciousness. The bestik (you can say steak instead) is also available in beef, chicken, prawns and they also serve wiener schnitzel. But the one that rule them all was definitely this ox tongue. Tender, gamey, and juicy with fries, carrots, mushrooms, beans, and cauliflower will sure make your dinner a pleasant experience of nostalgia. Unagi Yanagawa is a rare dish in many Japanese restaurants in Jakarta. The best one would be at Goemon. Not just that they serve it delectably, it’s also very affordable and abundant. When you drool every time you see an unagi sushi, instead you can have plenty of eels by choosing this dish. Heartwarmingly served as teishoku or set menu, the bowl filled with succulent eels are cooked with many vegetables and eggs, drenched in Japanese soy sauce where one would ask nothing else aside from this dish in a state of hunger on a cold night. 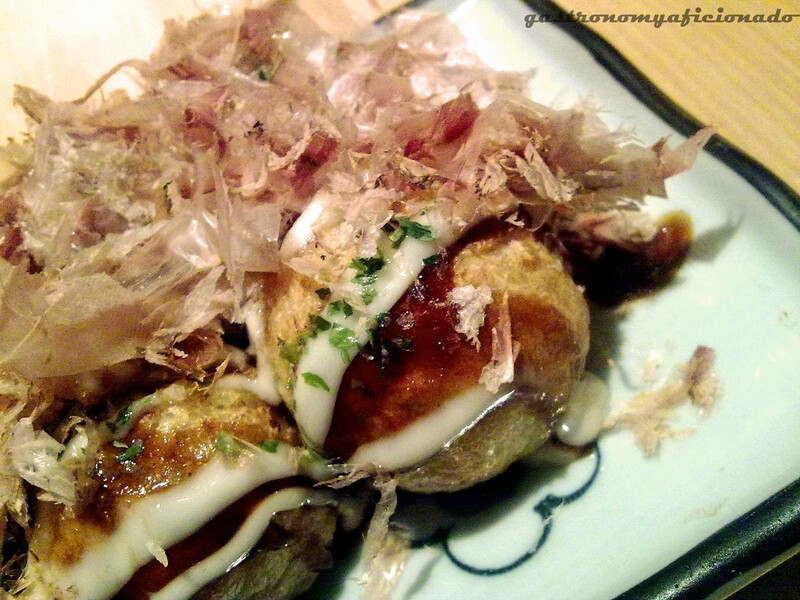 Indonesians these days can’t get enough from Japanese snacks but where to find the decent takoyaki? The answer is indeed in Sakana. With only IDR 30,000 taste six huge balls of takoyaki filled with octopus and shrimps dipped with special sauce and mayonnaise. Served hot and appear alive with all the dancing of the seaweeds on top of them. Accompany your snack time with a cup of ocha and you are now in Japan overlooking the sakura trees blooming in springtime. As one of the famous Acehnese restaurants in Jakarta, Meutia may be promoting more from their Mie Aceh dishes but strangely enough the shining star actually came from the Teh Tarik beverage. It’s skillfully pulled between the tea and the milk, served cold, and added with cinnamon quill. It’s exotic, refreshing, and good! One of the first decent dishes I tried when I came to Jakarta a few years ago. The chicken may be small (ayam kampung) but it is of good quality. Spiced and fried, added with its soul mate, the kremes, and ready to be dipped with sambal and eaten with warm rice is indeed the best way to enjoy good Indonesian rustic dish. People seem to be always amazed whenever they see the brutish portion of the ribs served in Warung Sapi Bali. Warung Sapi Bali is a virtuoso of in beef ribs. Not just tasty, it’s also spicy and comes with affordable price. The authentic urutan sausage was also created using 12 types of herbs which makes it delicious and hot. The beef rib fever proves to be far from abating and the only cure for it is only at this place. Mozaru is the house specialty! It’s a plate full of buttered rice with assorted toppings all cheesewashed with mozzarella and baked to perfection. You can pick from mushroom, chicken, beef, seafood, and the mix toppings or zenbu for this dish all available in three different sauces of tomato, butter, and homemade dynamite. Choose between butter rice or curry rice and add more cheese if you’re a maniac! Don’t be afraid to indulge yourself because Zenbu always give the calories meter on every dish so you can watch yours. Opens sharply at 11 AM to face the crowd who expect good lunch, Bebek Kaleyo offers a fast, flavorful fried ducks with rice. The fried duck is crispy, savory, and you have to make it complete with fried tempe or tahu. Try also the grilled ducks and bebek sambal hijau or fried ducks with green chili sauce. Dip them all in the tradition sambal and sweet soy bean. You’ll love it! Located strategically among the best place for backpacking and to find local food, this joint delivers a modest but delicious Soto Kudus. 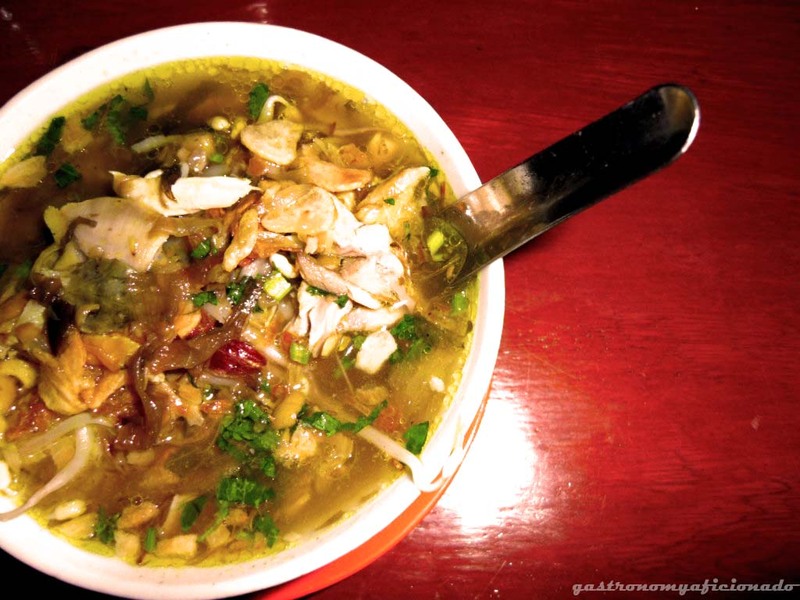 Served in small bowl, the soto or what Indonesian called as soup, is filled with rice, bean sprouts, fried garlic and shallots, and shredded chicken. The broth itself was very rich and that makes a soupy dish like this filled with energy. Accompanied by various satays of quail eggs and chicken livers and not to worry about the price, just have more and more because you can’t get enough from only a single bowl. Hotel Borobudur has always been the pioneer of the best sop buntut (oxtail soup) in Jakarta and after decades of their success they finally open the legendary Bogor Café at Pacific Place Mall. Now everybody can have their favorite oxtail soup nearer than ever. It’s hearty, soupy, tender, succulent, and watch out for the size. Don’t get too ambitious because it’s a treat for the contentment of your heart and soul. Also available in grilled version. 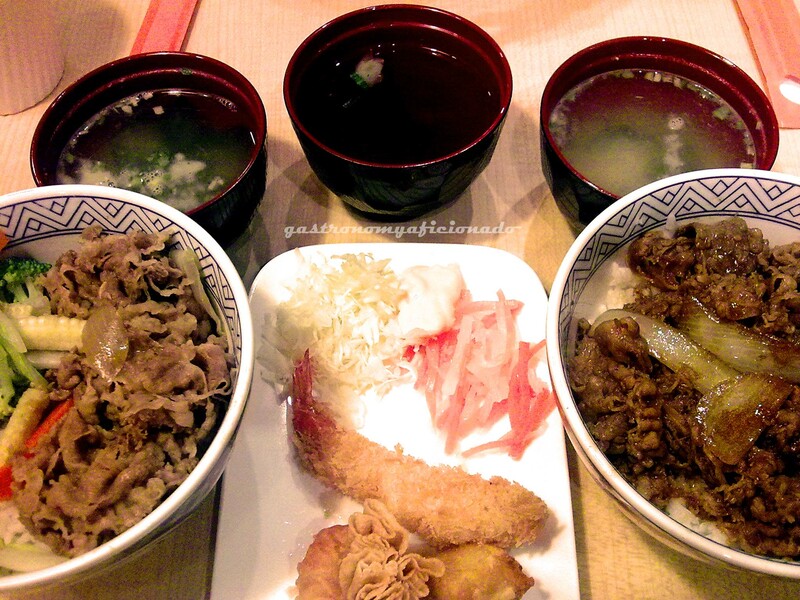 Japanese rice bowl dish now reigns over the hearts of modern Indonesian people nowadays. Yoshinoya strikes timely with its cheap with dishes that date back a century ago to satiate the appetite of many workers for their lunch and even for dinner. Add a clear soup or the original miso shiru to boost more energy. The difference here, queue first before you can feel the best of what a donburi has to offer. Bonjour French Pastry was brought by a Japanese pastry chef who originally started the business back in USA. Pastry Chef Yuji Shiraki, acclaimed as the guy behind Victory Cake for LA Lakers and cabin desserts for JAL, finally opens his way to Indonesia. 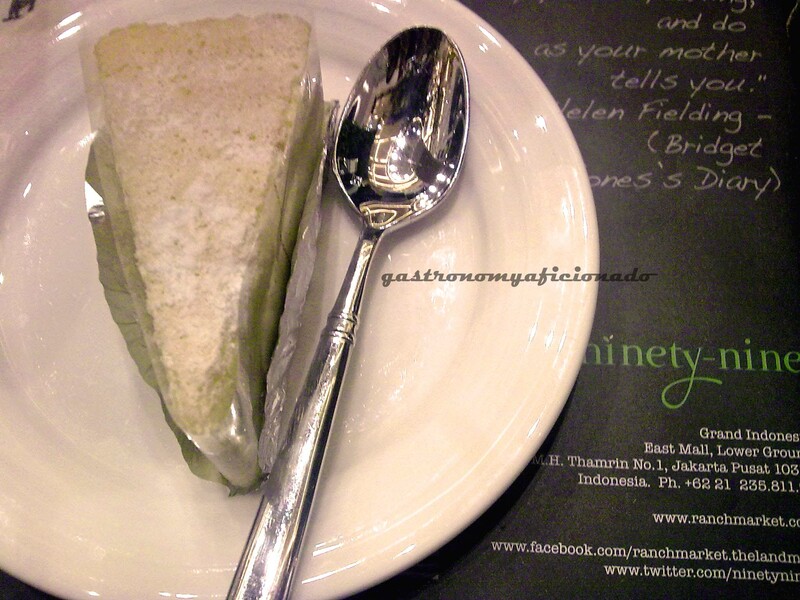 Introduce yourself with his one of the best, Rare Cheese Cake, for your afternoon tea. Smile because the cheese and the sweetness with the impeccable tenderness will guarantee your satisfaction. Need someplace cool aside from your usual coffee shop? Need a change of view? Come to Cork & Screw for the scenery of and elegant wine & dine joint with a view directly to the heart of Jakarta, Bundaran HI. 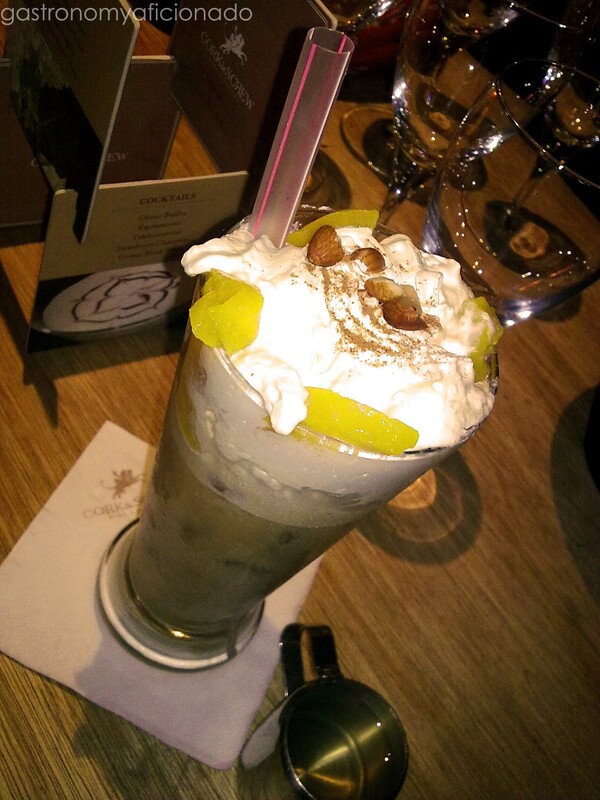 Choose Veneziano, a mixture of iced cappuccino with peach syrup, peaches, whipped cream, and a sprinkle of cinnamon. Take a sip, converse with your partner, but beforehand, have a wonderful dinner first with your favorite wine there. Kamameshi has always been one of the most traditional Japanese dishes and nostalgic faces will soon be lit from any Japanese whenever you’re talking about it. It was an ancient dish, full of life, cooked on a hotpot full of rice and with various types of meat, seafood, and vegetables. Served on an iron pot, the dish will become very fragrant, inviting, and the slightly burned rice on the corners of the pot is everybody’s favorite part. Watch out for the serving time because it takes almost 30 minutes, so make sure you reserve first to avoid waiting with an empty stomach. 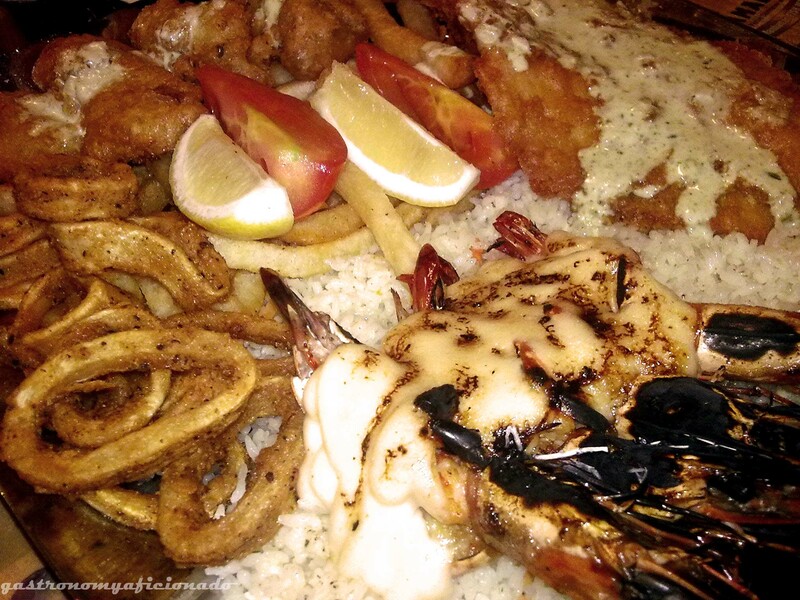 For modern seafood lovers, try the huge portion of seafood platter here where you can feast upon the selection of fried dory or cod, fried oysters or mussels, fried calamari, and their trademark Flame Grilled Prawns with melted mozzarella cheese. All of them topped on a bed full of garlic rice and French fries added with fresh tomatoes and lemons. The enormous size of the dish will even satiate the most lustful eater. A nocturnal dish famous in Java! Whenever you’re looking for Javanese dishes hawkers or in this case, Mbah Jingkrak, Mie Jawa is indeed only available during night time. This particular noodle is cooked with eggs and vegetables and can be added with meatballs, chicken liver, or shredded chicken. Cooked traditionally on a coal instead of stove because they say it’s more delicious that way. Thinly sliced, fried to extreme crispiness, and spicy, Kembang Goela’s dendeng balado has become a legend. Prepared beautifully and served in a big bowl, make your family dining day out a feast and enjoy more of Indonesian premium dishes here. 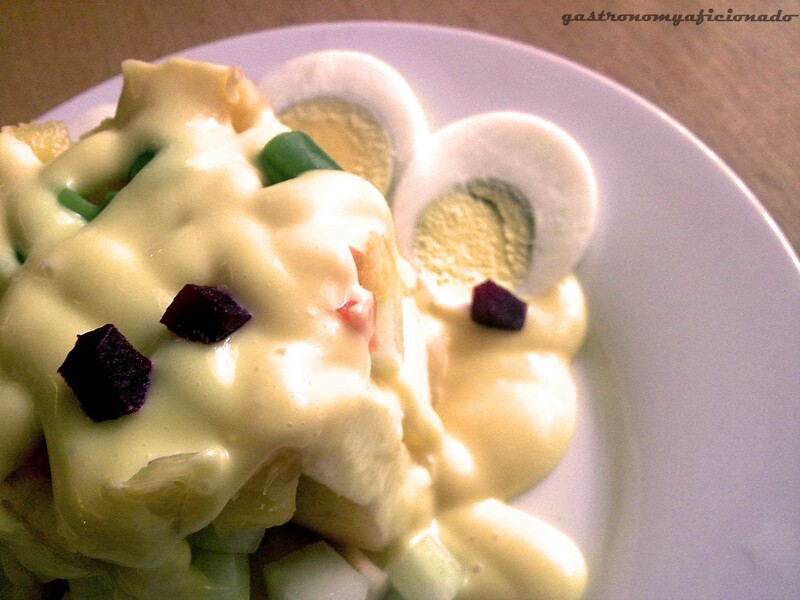 Richly dressed with Holland mayonnaise sauce, the sla or salad consists of eggs, potatoes, beans, pineapples, apples, and beets all diced. The fresh ingredients and the savory mayo tingles your taste buds and make you want more and more. Not to worry, HEMA has many delicious Dutch main courses to catch up with after you finish with the ultimate teaser. Hunnybear Cakery now decently competes with many prominent bakeries and patisseries all over J-Town. Thanks to the wondrous two layers of chocolate sponge cake filled with a layer of avocado cream and another layer of chocolate cream and ganache. The avocado taste makes it very exotic and tempting. You won’t stop until somebody told you to. 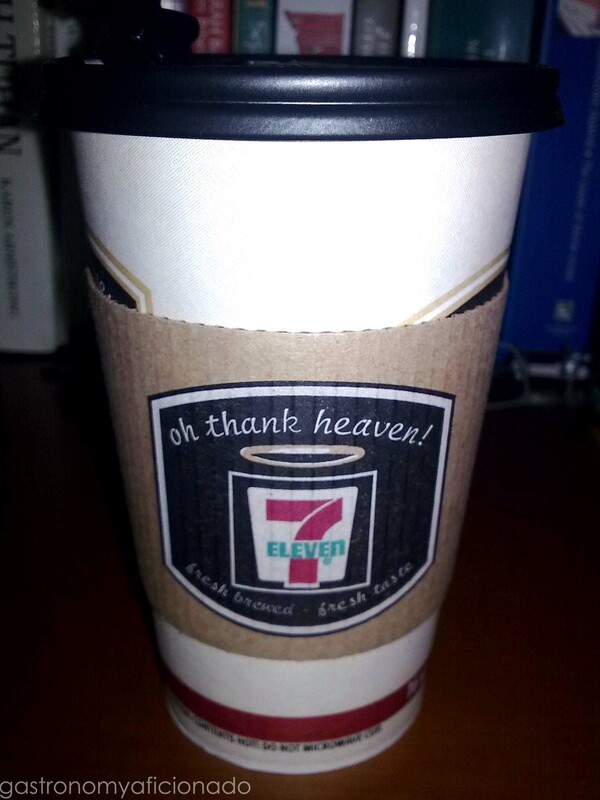 A sinful delight indeed! Sederhana is one of the leading Padangnese cuisine franchises all over Indonesia. The quality of each one of the dishes which served skillfully and all at once on the table are flawless, but certainly the heart of Padangnese cuisine should be at its Beef Rendang. This particular dish is known for the lengthy cook it needs to complete its darkish form but in the end you’ll taste a good, solid, and spicy meat best served with warm rice and other curryful Padangnese dishes. 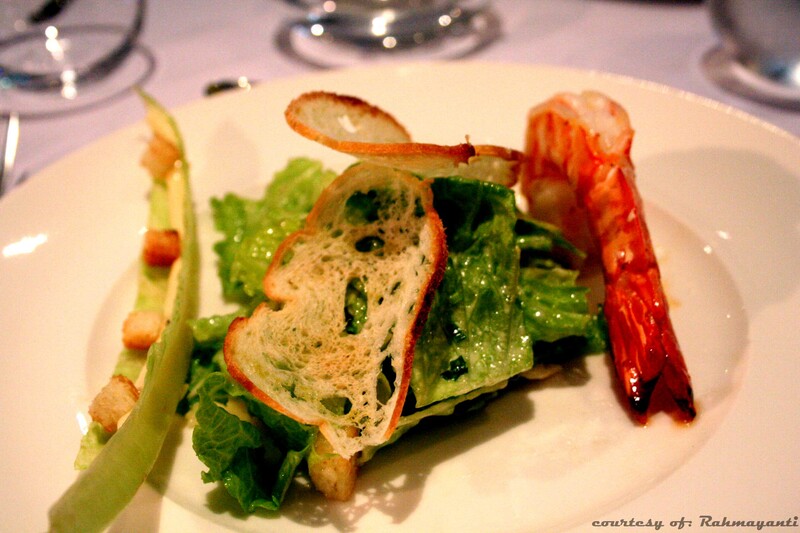 Chef Ivan Duchene introduces his three plats of lunch course with an extraordinarily big prawn salad and it was beautifully arranged. It was fresh and tempting. You will be most certainly got motivated for the next course. Emilie serves aristocratic modern and colorful dishes. Try the discovery course for your dinner. Make sure you taste everything Chef Duchene has to offer! Chef Alessandro Santi serves the pasta and delivers it to your table personally. 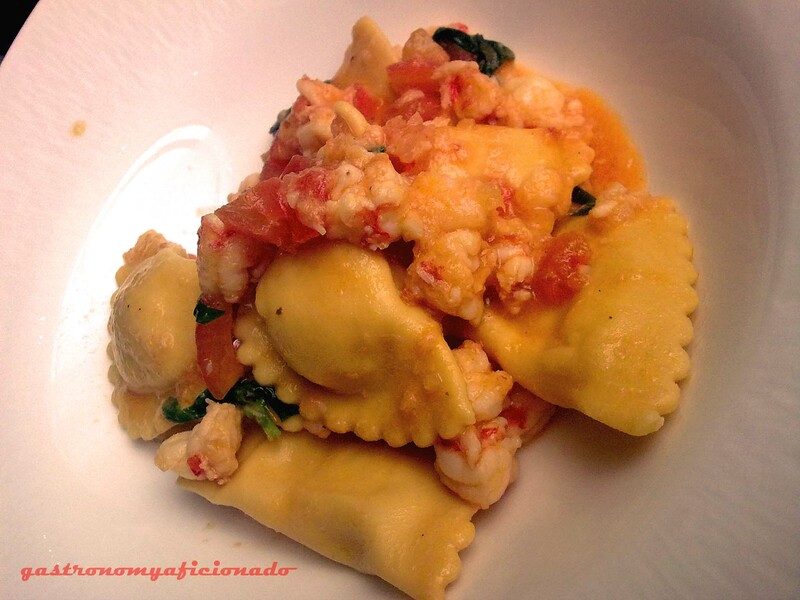 Helming Rosso for already a few years now, he serves different pasta dishes and notably was this Ravioli with Tiger Prawn Sauce. Alongside his other delectable dishes Lasagna Bolognaise, Dover Sole Cannelloni, Saffron Fettuccine, Spaghetti Rustichella, Farfalle, Black Olives Gnocchi, or Sea Bass Agnolotti, feel the majestic fares on Rosso’s all-you-can-eat Sunday Brunch! Satisfaction guaranteed! Cheap and cheerful, Oenpao is the herald of dim sum and Hainam rice dishes as the theme. Available in many places, ready to be franchised, and proudly local, Oenpao is about to rule the class of affordable and quick Chinese food. Try the magnificent Hakau Dim Sum. Filled with shrimps and served in four inside the warm steamer basket. Dip it in the traditional chili sauce and let the good feeling run inside your veins. Don’t let the appearance of the place and the dish fool you. Bebek Kurma may not seem that inviting. It’s basically a duck cooked in a thick potage made out of dates and herbs. Sounds good actually and all you have to do is tuck in and feel that the meat was really infused with all the goodness of the sauce. It’s tender, rich, and very succulent. It’s an Acehnese exotic that you really should try! What about a bowl full of classic bakmoy and rice? Designed uniquely resembling a face on the bowl, bakmoy is a heartwarming dish originally from Java. Omah Sendok’s version of bakmoy was a triumphal one. It’s filled with small cubes of tofu, chicken, and egg with succulent chicken broth. A fare for good health and I was instantly recovered from my illness. This may be corny comparing with the real coffee from specialized coffee shops but 7 Eleven version of cappuccino is the answer for a satisfying and affordable coffee. Customizable in size and free of charge if added with any syrups that you like, 7 Eleven’s cappuccino is served hot, steamy, sweet, and costs you only around IDR 10,000. It’s good-to-go coffee to wait for Jakarta’s traffic to abate or just face it with the good old hot cappuccino while you’re driving! Located strategically in front of Jatinegara Station in East Jakarta, Ayam Goreng Bu Haji has reigned over for Sundanese style fried chicken for many years now. The difference between the usual fried chicken however is the chicken itself, it’s not fried to maximum crispiness but a bit ‘drench’ somehow. Even so, it’s a very luscious one where you can feel the good, savory taste of the chicken. Served with peanut sambal instead of the usual sambal terasi and that adds the sweet flavor to your dish. This traditional Sundanese soup can be found literally everywhere these days but Sari Idaman surely serves one of the best. The fresh sweet and sour taste thanks to the tamarind-based soup added with many exotic vegetables such as peanuts, jackfruit, melinjo, long beans, and corns. Sayur Asem is usually served as a companion to boost your appetite when you’re having Sundanese dishes feast. Make it a must when you do that. The rice dishes at Pepper Lunch, a famous franchise from Japan, are actually a DIY fried rice but served on a sizzling magnetic hotplate and added with high quality beef from Aussie and NZ, Norwegian Salmon, chicken, or unagi. The most favorite one would be the curry beef pepper rice with cheese where they added the Japanese dried curry and will make everything turned brownish when you stir ‘em up with the cheese as well. Add the sweet or savory ketchup to your liking and max out the black pepper because you’re in Pepper Lunch. Kung Pao dishes may be quite common in many Chinese restaurants but the one in Chicken Master was very delectable. First of all, choose your rice first, I’d recommend the Hainam rice because it suits well and delicious. Then top it with the Prawn Kung Pao. The already peeled prawns were stir fried together with the spicy Sichuan style condiments and ingredients and notably added with cashew nuts. Though the name indicates that they’re specializing in chicken, the chef who happens to come from Hong Kong can surely treat you well in any other dishes!